Great plans go nowhere without people to make the strategy happen. But how do you keep people engaged in a marathon when the sidelines are so full of distractions? If, as Heraclitus said, “everything changes and nothing remains still,” how can we ever get anything accomplished? A couple of weeks ago I read an excellent article from Bain & Company, Building Efficient Organizations that summed up the issues nicely. Leaders spend entirely too much time and effort chasing the next “bright shiny object,” “next big thing,” “squirrel” or whatever your phrase of the day is, instead of preparing to win the marathon. The result? Success is more often driven by good luck, than well-executed strategy. While the focus of the Bain Brief was cost efficiency, the core message that strategies most often fail because they are approached as short-term initiatives applies to every aspect of organizational change. And as we all know, if you aren’t constantly evolving, you aren’t just standing still, you are rapidly falling behind. What’s to be done? First hang a sign that you will see every day that says “VUCA” in big bold letters to remind you that today’s world is always volatile, uncertain, complex and ambiguous. That way when you go to plan a project – be it a new app, large-scale system integration or major departmental reorganization – your perspective will be informed by the realities of the external environment. The heart of making strategy work is people. Great plans go nowhere without people to make the strategy happen. But how do you keep people engaged in a marathon when the sidelines are so full of distractions? Or to reframe the question, how do you achieve a long-term goal in a world driven by instant gratification? You start by stopping. Stop building short-term initiatives designed to deliver long-term results. Instead change your approach and leave the long-term planning to R&D. I’m not saying to give up on long-term strategies, but instead to break them down in to a series of short-term initiatives and stop chasing the long-term effort altogether. By simply focusing on the short-term initiatives, the long-term strategy will work itself out. 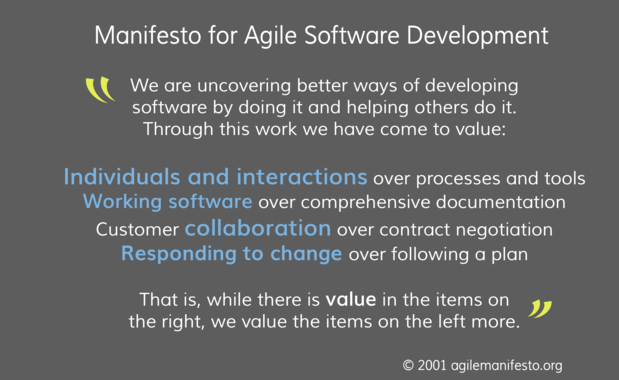 And this is where the Manifesto for Agile Software Development can serve as a guide for making strategy work, because, as noted in number one below, it helps put the emphasis on people over process or tools. 1. Individual and interactions over processes and tools: Here, the Manifesto tells us to think about the complete journey that people need to go through to achieve the desired outcome and to find ways to help them work collaboratively to identify a flexible solution that can then become a simple, repeatable process. Only then can you build or buy a tool to increase the efficiency of the work. 2. Working the strategies over comprehensive documentation: While there are still plenty of people in the world that want to see a detailed plan for every initiative that explores every risk and option and details the budget down to the last NPV cent a decade from now, that detailed an approach should only be used when absolutely necessary. Most of the time, a high-level plan that overviews key outcomes, team leads and deadlines for the first 30 to 90 days of a project is good enough. A major benefit of using the agile sprint approach to strategy execution – small chunks of work that can be announced as complete in short definite steps – is the delivery of a constant flow of instant gratification. 3. Collaborative dialogue over one-way communications: People and communications are essential to the success of any initiative. Leaders need to seek out and employ the full range of tactics that will engage work teams, executives and other stakeholders in an on-going and collaborative dialogue. Also, don’t get caught up in elaborate communication processes and systems. Keep it simple and be – though the word is overused – genuine. If you aren’t a committed participant, no matter how hard you try, you won’t be able to motivate anyone else to be either. 4. Adapting the strategy over following the plan: Too many people use plans as rulebooks or worse, a means to hold people’s feet to the fire (if you have to hold people’s feet to the fire you have bigger problems). A plan is just a guide, not a rule book. I love maps. I used to travel to places and stare at the map. I ended up learning the map and in the process missed what I’d come to see. Look up, glance at the map from time to time to be sure you are on track and to as a resource to find alternative routes. If you are sitting there reading this and going but…, but… you’ve missed the point. All those “buts” are important and real, but by the time you address all the “buts” and nail something down, the world – including your clients and your competitors – will have moved on.